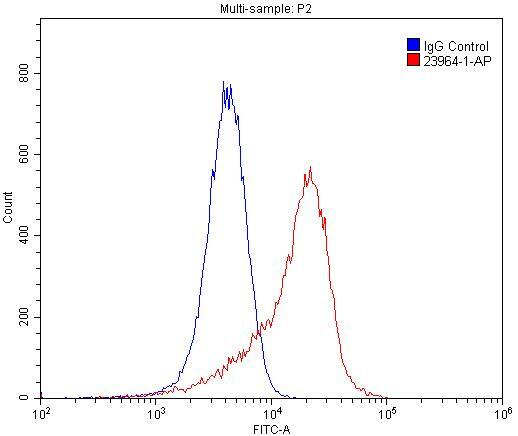 1X10^6 HUVEC cells were stained with 0.2ug CLEC14A antibody (23964-1-AP, red) and control antibody (blue). Fixed with 4% PFA blocked with 3% BSA (30 min). Alexa Fluor 488-conjugated AffiniPure Goat Anti-Rabbit IgG(H+L) with dilution 1:1500. CLEC14A is a single-pass type I transmembrane protein whose extracellular domain consists of a C-type lectin-like domain (CTLD), a series of epidermal growth factor-like domains, and a sushi-like domain (PMID: 23644659). CLEC14A is a member of the C-type lectin domain superfamily that also includes endosialin, thrombomodulin and CD93 (PMID: 16336259). It has been reported that CLEC14A is specifically expressed in endothelial cells and mediates cell to cell adhesion (PMID: 21095181). CLEC14A may be involved in tumor angiogenesis (PMID: 21706054; 23644659).